What is the relationship between SIS, term dates, course dates, and section dates? SIS, term dates, course dates, and section dates are very symbiotic. All of them flow together in all aspects of Sublime LMS. has all the information for the students for the course that can be imported into Sublime LMS via the institution. This setting is on the Account level. SIS imports can create the Term dates. These dates are a chunk of time (i.e. Semesters, Trimesters, Quarters). As you create a term, the student, teacher, and TA access dates will, by default, inherit the Term Runs from [date or term start] to [date or term end] dates unless an explicit date is entered in the fields. In this example, the SIS import created a term date from July 22, 2014 to Dec 26, 2014. Administrators have control over when specific users can access the courses. Students generally do not have access until the term begins, while instructors and designers will generally be granted access before the term begins. If no specific dates are entered, dates will default to the term dates and display as term start and term end . Note: SIS imports cannot specify specific dates for each user group. Those dates must be changed manually. Course dates are within the Term dates. However, if you open a course and change the access dates in the Course Details, you can override the term date settings. The course dates  can start and end on any date between the Term dates. Checking the Users can only participate... checkbox  ensures that students can only access the course between those dates. Note: When using this checkbox, instructors and other course admins will still have access to the course outside these dates. For example, if the term dates were July 22, 2014 to Dec 26, 2014, the instructor could set access to the course two days later on July 24 and end the course a week earlier than the end of the term on Dec 26. By shortening the course end date, and selecting the student participation checkbox, students will not have access to the course after that date, giving the instructor time to complete grading before Dec 30 (the course access end date set for instructors in the Term Details). The Section dates are the most mobile. Sections can be moved from term to term or course to course. Any section settings date changes will override any term or course settings. Make sure the students are not concluded in the courses or sections before you move them. Sections can have various start and end dates. Perhaps one section begins July 27, 2014 and ends Sep 20, 2013. Another section may begin Oct 4, 2013 and end December 20, 2013. 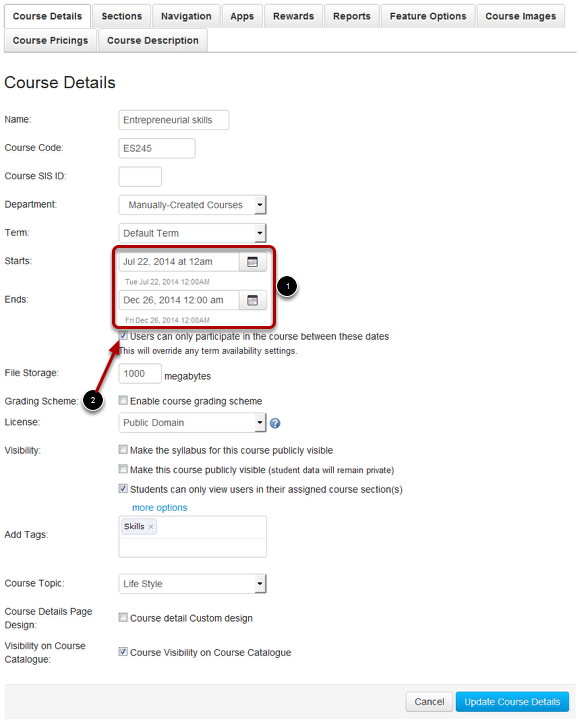 Sections within the same course can share course material and have varied due dates.